After a long day of work, avoid the crowds at the local bar or brewery and enjoy a refreshing glass of home brewed draft beer in the comfort of your own home! With this Kegco HBK209B-2 Dual-Faucet Homebrew Kegerator, you can keep two kegs of your very own home-brewed beer perfectly chilled and ready to dispense whenever you want them. Great for parties, family gatherings, or just a couple of guests, this homebrew keg dispenser will impress your friends and family almost as much as the delicious taste of your homebrew beer! 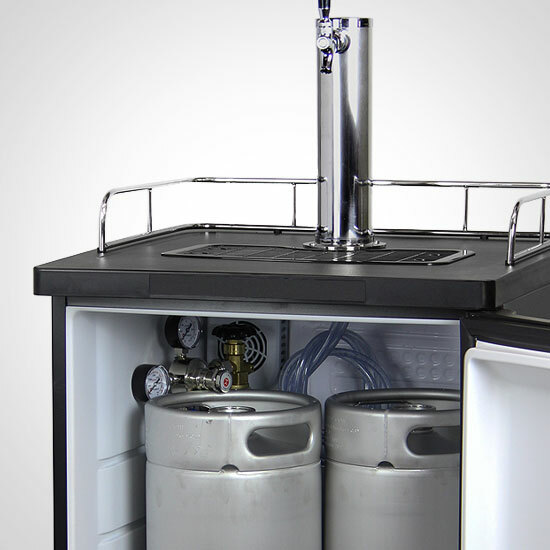 This unit comes completely outfitted with everything you will need to begin serving beer from your brand new kegerator - you just add the CO2 gas and the kegs of beer! The homebrew experts at Kegco have designed and included a special two-product homebrew direct draw kit with premium upgrades like a polished stainless steel draft tower, double gauge regulator, and corrosion resistant red CO2 cylinder added at no additional cost for a savings of $37! This kegerator's black cabinet is fitted with a stylish matte black door that is less prone to showing smudges and fingerprints. 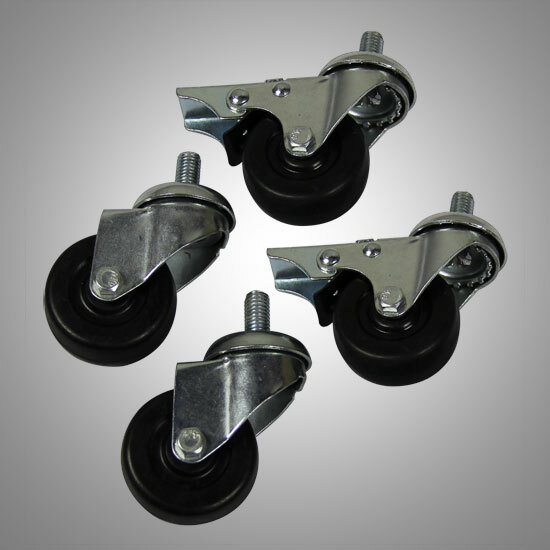 It features four locking casters for easy mobility and a dishwasher-safe removable plastic drip tray that collects drips and spills for hassle-free clean-up. Additional features like an energy efficient design and manual temperature control allow you to adjust the temperature of the keg to enhance your beer's flavor and consistency while causing minimal impact on the environment and your energy bill. Two removable shelves are also included to let you use your keg cooler as a regular refrigerator while you're waiting for your next batch of home-brew to finish fermenting. 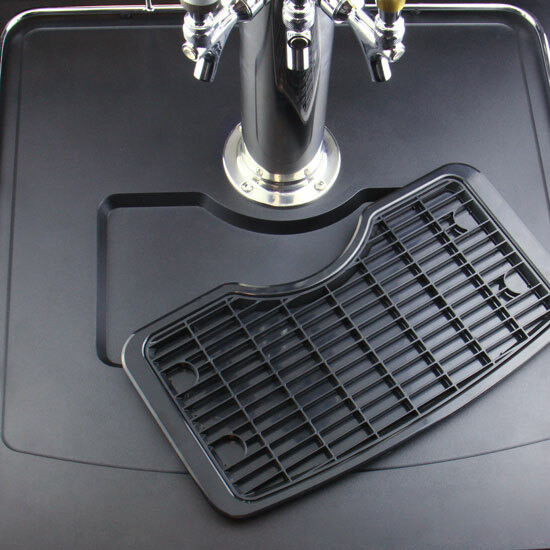 If you have ever had to deal with the mess of sticky dried beer, you will appreciate the removable recessed drip tray with a plastic grill that can be taken out and cleaned in your dishwasher. This beer keg refrigerator has a spacious interior that easily accommodates any full size keg (including Coors Kegs, Miller Kegs, and rubber kegs! ), as well as up to two 5-Gallon D System kegs or up to three 5-Gallon Cornelius Ball Lock Home-Brew Kegs. This large capacity gives you the option to dispense more than one beer keg at a time. This versatile keg dispenser does more than just dispense delicious beverages. 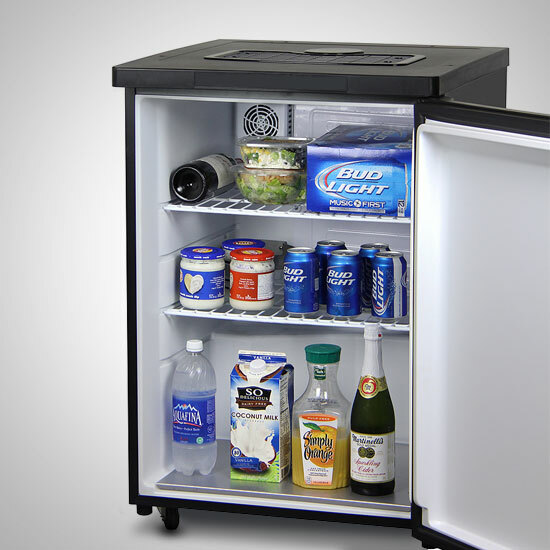 If you need extra refrigerated storage when not dispensing beer, this unit can be converted to an all-refrigerator using the 2 included adjustable shelves. These shelves can be spaced far enough apart to hold gallon jugs or 2-liter bottles, and you can even store wine thanks to the wide temperature range.